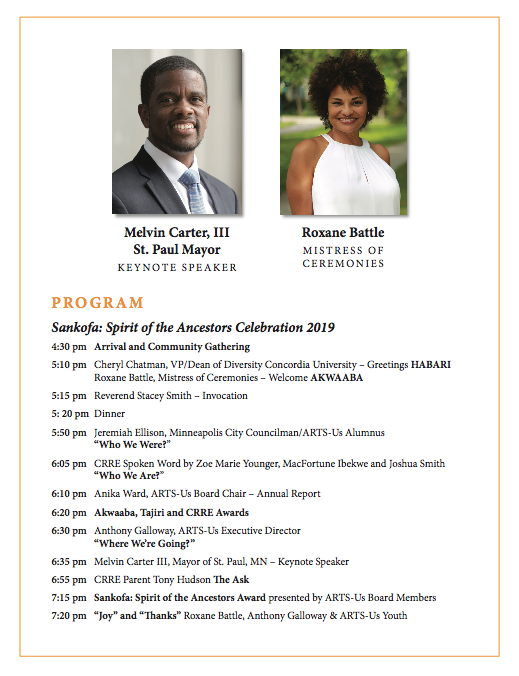 FOR IMMEDIATE RELEASE (April 11, 2019) St. Paul, Minnesota – ARTS-Us is a community-based 501(c)(3) organization founded in 1992 by a group of African American artists, and multicultural educators. Using the experiences of the African Diaspora at its core and collaborating with artists, educators, and communities of other backgrounds and cultures, ARTS-Us provides “edutainment” programs to schools, business and community environments. ARTS-Us’ three major programs: Camp Teranga summer workshops, Timbuktu after-school programs, and the Civil Rights Research Experience help to develop young leaders through the Arts, culture, and sciences of the African Diaspora. In addition, ARTS-Us provides cultural performances, art and art resources for educators, students, community business and civic organizations through the lens of the African Diaspora. Sankofa: Spirit of the Ancestors Celebration 2019 is an opportunity to welcome the community to reflect on 26 years of developing youth leaders through African Arts, Culture, and Sciences featuring a heritage presentation of music, dance and video produced by ARTS-Us youth, followed by a keynote address by ARTS-Us alumnus, Mayor Melvin Carter, who will share his story about how African cultural programming at ARTS-Us impacted his life. That’s what is meant by Sankofa, “go back and fetch it,” as African ancestors taught.